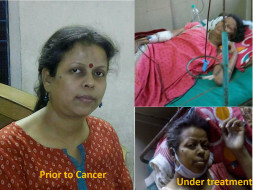 Help Mahua fight Cancer (CLL with p53 mutation)! My very close relative (like my elder sister), Mahua, was diagnosed for "Chronic Lymphocytic Leukemia Binet C (p53 mutation)" at the end of the year 2015. She received 3 cycles of Chemotherapy with FCR protocol from May to July 2016. She tolerated Chemotherapy well but then developed Cytopenia for which she has been getting PRBC and Platelets transfusion almost every other day. Now her condition is very serious. Doctors have prescribed for "Ibrutinib" (140 mg) capsules (4 capsules per day) for a year which are very expensive ~ Rs. 18,00,000/- (Rupees Eighteen Lakhs only) (~ $28,000). After which they will consider Bone Marrow Transplant is required. 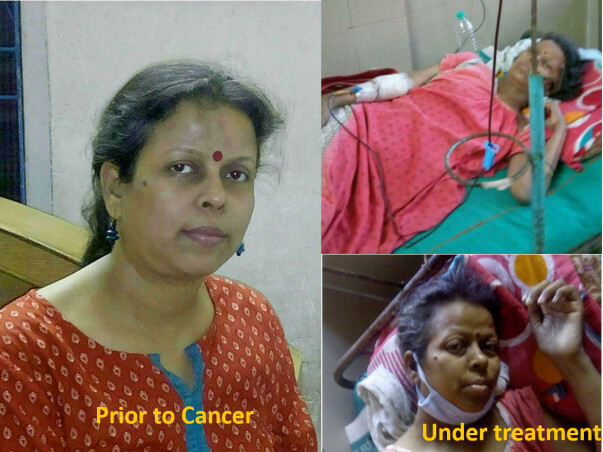 Mahua, her husband and 14 years old daughter are bankrupt due to the medical expenses they have incurred so far. They are on the verge of selling the only house they have which is not enough to bare the expenses incurred and the future treatments. Hence this appeal for support from well meaning people all over the world to extend any help they can to support my sister Mahua. Mahua is still getting PRBC and Platelet transfusion but one good thing is that her Platelet count is now little higher than before. She is now taking the "Ibrutinib" capsules (one per day instead of 4 per day). Whenever her Platelet count will be almost normal she will be able to take 4 capsules per day. Please ask your freinds to donate generously and share as much as possible. Thanks for your help. Please ask your friends to support Mahua. As I mentioned before that Mahua developed Cytopenia for which she has been getting PRBC and Platelets transfusion almost every other day. Her Platelet count is still very low and she has been still getting 18 units of platelets and 6-7 units of PRBC every week. 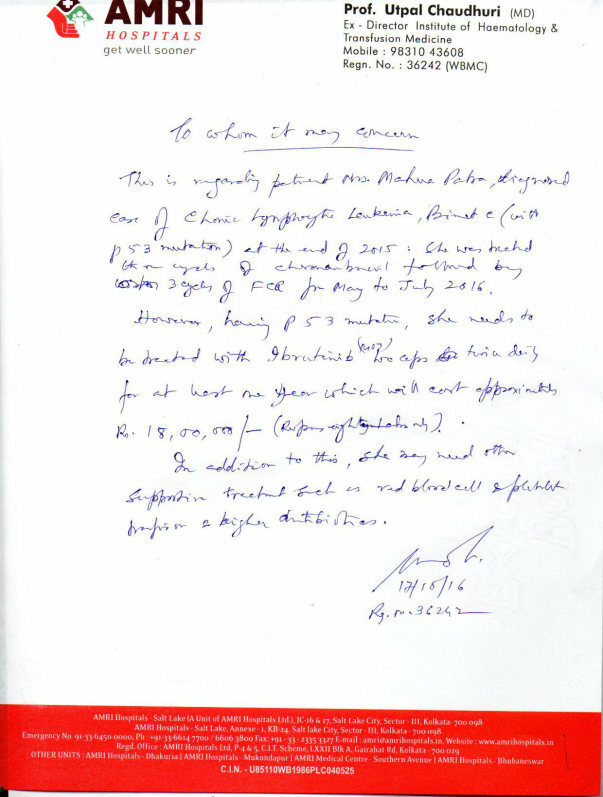 The cost of which is almost Rs.15000.00 per week (excluding other medical expenses). It could take few weeks to few months to get higher platelet count to a certain limit after which Doctors could be able to administered “Ibrutinib”. So the situation is no less than a struggle now, both financially and emotionally. Do continue to donate generously and share as much as possible so we can support Mahua to overcome from this very hard situation. Hello Arun, I very much hope and pray that Mahua recovers soon. Good luck to Mahua and her family.